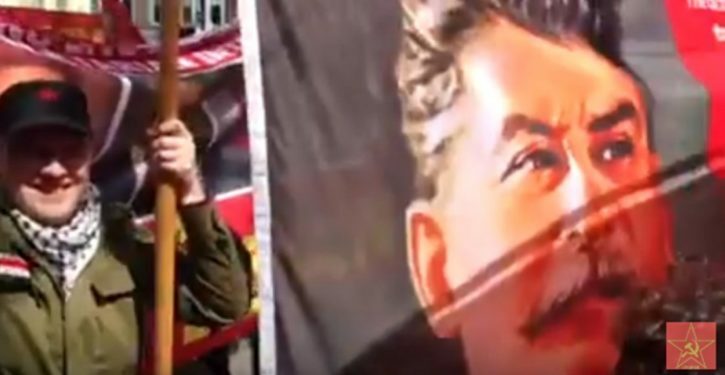 Protesters marked International Workers’ Day with a rally in London’s Trafalgar Square today, with some marchers holding up pictures of Soviet dictator Joseph Stalin. The action, marking International Workers’ Day, which dates back to the early days of the trade union movement, coincided with a strike by some staff at McDonald’s over pay and union recognition. One banner, pictured by Twitter users, featured a large portrait of Stalin, along with a quote from his work speaking of the ‘dictatorship of the proletariat’ and the transition from capitalism to communism.